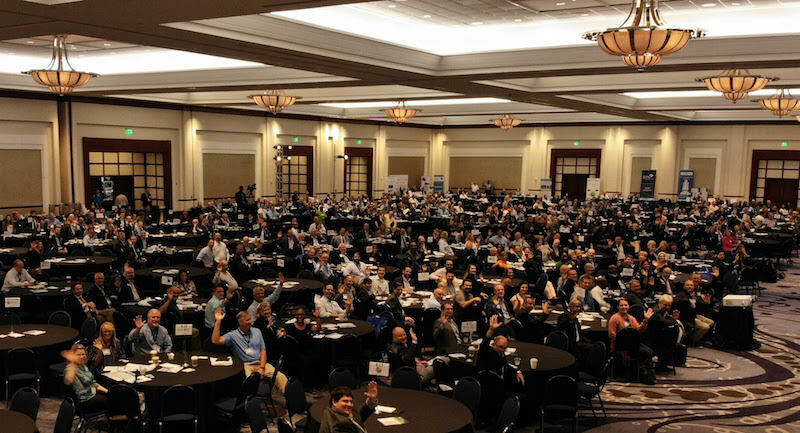 The status of general manufacturing in Georgia is “Flying High” as exemplified by the theme, keynote speakers, panel members, and award winners at the 2018 Georgia Manufacturing Summit held last week at the Cobb Galleria in Atlanta. Specifically, the state leads the U.S. in aerospace manufacturing. Host, Jason Moss, President of the Georgia Manufacturing Alliance (GMA), welcomed nearly 800 attendees to the fourth annual conference. In conjunction with the “Flying High” theme, Moss even used a drone to take pictures of the large crowd inside the ballroom in order to emphasize the multiple opportunities available to network, to learn from peers, and to potentially initiate business with one another. Erik Rojek, CEO of Thrush Aircraft in Albany, Georgia, got the day’s program off the ground figuratively as the Breakfast Keynote Speaker. Rojek began his presentation with a litany of statistics about the 53-year aeronautics company, which has delivered over 2,200 specialty aircraft in its history in the U.S. and to 60 other countries, with international sales accounting for 70 percent of their business. Employee growth has increased from 60 employees back in its infancy to 240 today, and, while the company motto has been “Feeding the World,” the agricultural aircraft manufacturer has expanded its reach significantly in recent years from crop spraying and sowing rice to include markets as diverse as forest fire-fighting, border surveillance, mosquito control, and combating oil spills, to list a few. Other advantages of having their manufacturing operations in Georgia include a good supply chain for planes, a workforce with varied skill sets, and the climate, which allows favorable weather for testing of aircraft coming off the assembly line. Thrush embraces technology, primarily with its partner, General Electric, such as installing GPS on their planes, allowing pilots to do precision applications and helping to optimize yield per acre. The company’s training center in Albany provides a simulator with a unique dual cockpit, as well as maintenance instruction, turbine pilot transition, and emergency procedures. As a Savannah native and an employee of Gulfstream for 35 years, Mark Burns, President, has seen and participated in the soaring growth of Gulfstream. When he began with the company, it employed less than 1,000 people, and now has a workforce of 9,000 in Savannah and 500 in the Brunswick operation. Gulfstream, a wholly owned subsidiary of General Dynamics, has manufactured 2,800 jet aircraft since the first G1 was produced in Bethpage, Long Island in 1958. Today the product line includes five models, the latest being the flagship G650ER, which sells for $70 million. He added that the demand for Gulfstream jets is based upon the benefit of speed and the value it offers executives as they fly around the world. For example, the planes can fly from London to Hong Kong in about ten and a half hours. Speed reduces the cost of information, that is, the travelers’ time, and it reduces the pilot’s time and fatigue factor, as well. The air inside is 100% fresh. The sound is the quietest in aviation and the large windows allow more natural light. The planes can fly for as long as 16 hours. The military also utilizes Gulfstream aircraft for reconnaissance. Over 200 special mission craft are in service around the world. When asked what has changed in his 35 years with the $8 billion company, Burns responded, “How we build planes.” In particular, over the past 15 years or so, said Burns, “Innovation and technology are the cornerstone to zero defects at all plants.” Two prime examples are the use of precision 3-D technology, and robotics that allow for bonded panels to be done on multiple sides at a time. In addition, Gulfstream’s simulator technology is designed to make pilots safer and to minimize mistakes. Yet with all of the tools available in the world, “It all comes back to people,” Burns emphasized. “Our people take pride in the work, every detail matters from a craftsmanship standpoint.” Attracting and investing in talent is key. The training center includes an actual plane on which trainees work. Similarly, Gulfstream is partnering with Georgia Southern University, technical schools, and high schools, all the way down to 5th grade level to develop and attract talent. Over 1,000 participants have gone through student leadership programs since 2008. “We owe it to the community,” noted Burns. Furthermore, Gulfstream’s community involvement includes a sustainability plan with the Georgia Conservancy because they want to be seen as a good steward of the environment by making the air cleaner with reduced emissions, reduced noise and by using renewable fuels. “As a company we’re thinking about sustainability, not just in our operations, but in our products, as well,” said Burns. Following the presentation, Moderator, Joanne Sanders, President of EWISE Communications and International Manufacturing Liaison and Market Leader for the Georgia Manufacturing Alliance, and Moss awarded Burns with membership in the GMA Hall of Fame.